The SCW connectors offer 1" of upward and 1" of downward movement. They are primarily used in head-of-wall applications that require vertical movement relative to the structure. SCW connectors are often used to strengthen window and door jambs for projects that utilize slip track. Use the specified number of #14 shouldered screws (included). Install shouldered screws in the slots adjacent to the “No-Equal” stamp. Submittal/substitution request for SCW head-of-wall slide-clip connectors for cold-formed steel construction. When the SCW5.5 connector is used with two shouldered screws, install screws in the outermost slots. Allowable loads are based on clips installed with all holes in the anchor leg filled with #12-14 screws. 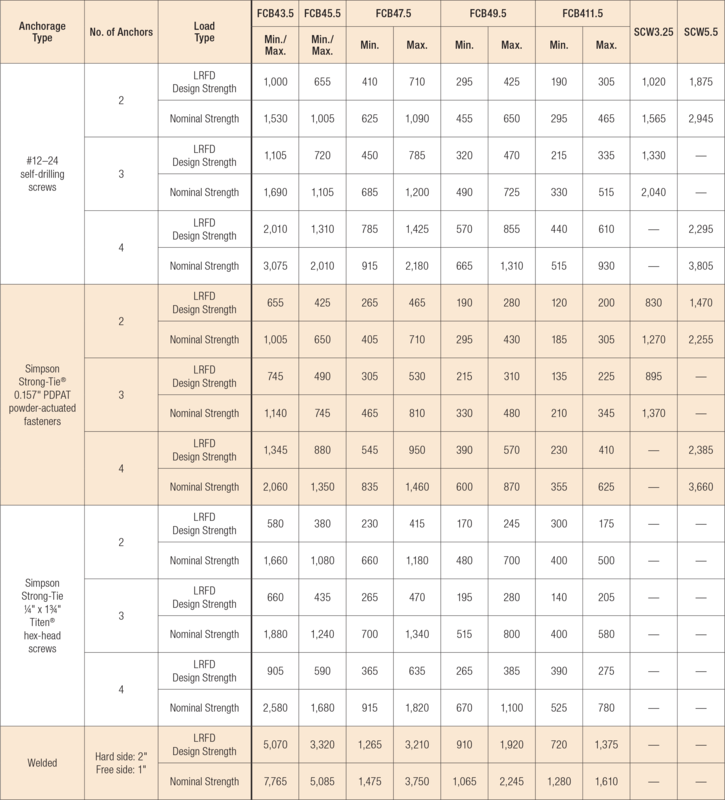 For other anchorage installations, the capacity of the connection system will be the minimum of the tabulated value and the allowable load from the SCW Allowable Anchorage Loads table below. For LRFD design strengths, reference the SCW Service Load Limits, LRFD Design Strengths and Nominal Strengths table below. Allowable loads are for clip anchorage only. The capacity of the connection system will be the minimum of the tabulated value and the allowable load from the SCW Allowable Connector Loads table above. Tabulated values are for the anchorage only. The assembly strengths are the minimum of those listed above and the connector capacity and attachment to the stud-wall framing listed in the SCW Service Load Limits, LRFD Design Strengths and Nominal Strengths table above. For the Service Load Limit, use the values listed for the connectors in the SCW Service Load Limits, LRFD Design Strengths and Nominal Strengths table above. SCW See specific model numbers for code listings.